[Win] Calling Subs or UDFs from VBA was causing an error (GH998). While we’re all waiting for the new native dynamic arrays, it’s still going to take another while until the majority can use them (they are not yet part of Office 2019). There’s a small breaking change in the unlikely case that you were assigning values with the expand option: myrange.options(expand='table').value = [['b'] * 3] * 3. This was previously clearing contiguous cells to the right and bottom (or one of them depending on the option), now you have to do that explicitly. Importing multiple UDF modules has been fixed (GH991). See Asynchronous UDFs for the full docs. This release adds a REST API server to xlwings, allowing you to easily expose your workbook over the internet, see REST API for all the details! xlwings can now be used with threading, see the docs: Threading (GH759). [Py27] Bug Fix for a Python 2.7 glitch. This release adds support to call Python functions from VBA in all Office apps (e.g. Access, Outlook etc. 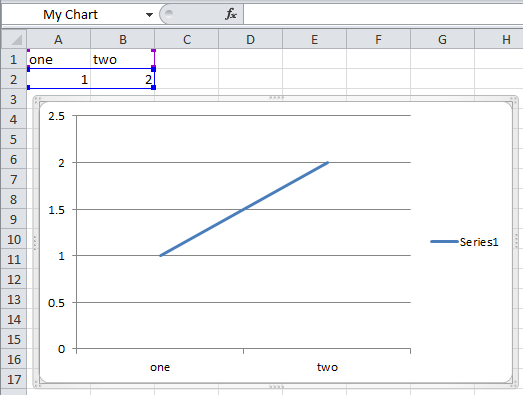 ), not just Excel. As this uses UDFs, it is only available on Windows. See the docs: xlwings with other Office Apps. Previously, Python functions were always returning 2d arrays when called from VBA, no matter whether it was actually a 2d array or not. Now you get the proper dimensionality which makes it easier if the return value is e.g. a string or scalar as you don’t have to unpack it anymore. Other bug fixes: GH889, GH939, GH940, GH943. [Mac] Mac Excel 2011 is now supported again with the new add-in. However, since Excel 2011 doesn’t support the ribbon, the config file has be created/edited manually, see Global Config: Ribbon/Config File (GH714). [Win] How to use imported functions in VBA, see Call UDFs from VBA. For more up-to-date installations via conda, use the conda-forge channel, see Installation. You need to update your xlwings add-in to get the fixes! The add-in can be extended with own code. We throw in an sql function, that allows you to perform SQL queries on data in your spreadsheets. It’s pretty awesome, get the details here: Extensions. RunFrozenPython now requires the full path to the executable. The xlwings CLI xlwings template functionality has been removed. Use quickstart instead. [Win] Bug Fix: v0.10.3 introduced a bug that imported UDFs by default with volatile=True , this has now been fixed. You will need to reimport your functions after upgrading the xlwings package. This release adds an often requested & powerful new feature to User Defined Functions (UDFs): Dynamic expansion for array formulas. 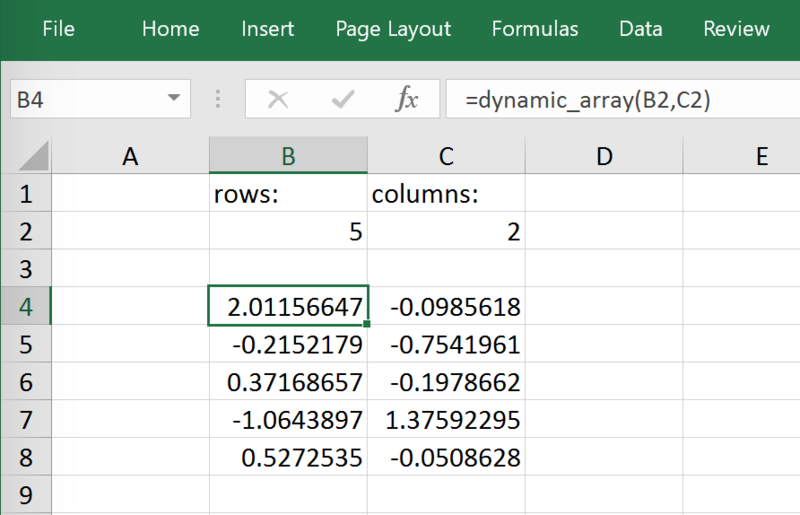 While Excel offers array formulas, you need to specify their dimensions up front by selecting the result array first, then entering the formula and finally hitting Ctrl-Shift-Enter. While this makes sense from a data integrity point of view, in practice, it often turns out to be a cumbersome limitation, especially when working with dynamic arrays such as time series data. 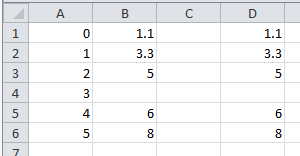 Note: Expanding array formulas will overwrite cells without prompting and leave an empty border around them, i.e. 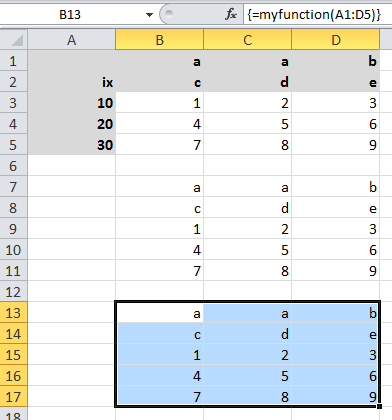 they will clear the row to the bottom and the column to the right of the array. The int converter works now always as you would expect (e.g. : xw.Range('A1').options(numbers=int).value). Before, it could happen that the number was off by 1 due to floating point issues (GH554). [Win] App.visible wasn’t behaving correctly (GH551). [Mac] Added support for the new 64bit version of Excel 2016 on Mac (GH549). Unicode book names are again supported (GH546). xlwings.Book.save() now supports relative paths. Also, when saving an existing book under a new name without specifying the full path, it’ll be saved in Python’s current working directory instead of in Excel’s default directory (GH185). Exciting times! v0.9.0 is a complete rewrite of xlwings with loads of syntax changes (hence the version jump). But more importantly, this release adds a ton of new features and bug fixes that would have otherwise been impossible. Some of the highlights are listed below, but make sure to check out the full migration guide for the syntax changes in details. Note, however, that the syntax for user defined functions (UDFs) did not change. At this point, the API is fairly stable and we’re expecting only smaller changes on our way towards a stable v1.0 release. For more details, see Syntax Overview. See here for details about which bugs have been fixed. [Win] UDFs returning Pandas DataFrames/Series containing nan were failing (GH446). [Win] RunFrozenPython was not finding the executable (GH452). The xlwings VBA module was not finding the Python interpreter if PYTHON_WIN or PYTHON_MAC contained spaces (GH461). [Win]: VBA settings: UDF_PATH has been replaced with UDF_MODULES. The default behaviour doesn’t change though (i.e. 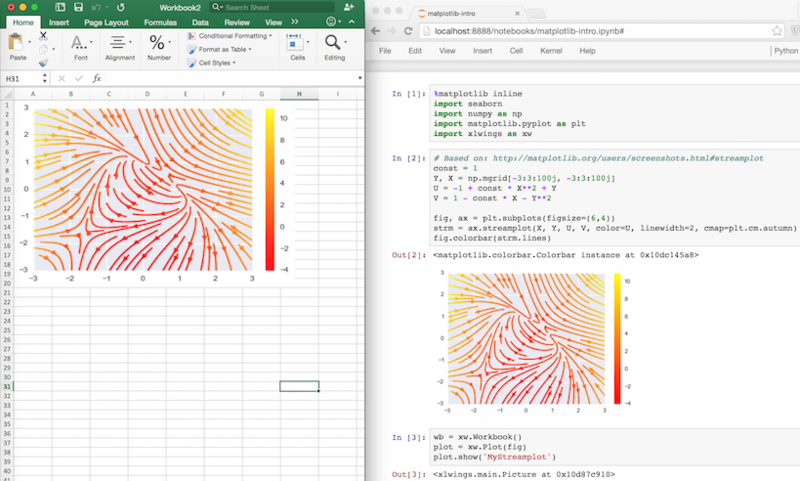 if UDF_MODULES = "", then a Python source file with the same name as the Excel file, but with .py ending will be imported from the same directory as the Excel file). LOG_FILE: So far, the log file has been placed next to the Excel file per default (VBA settings). This has been changed as it was causing issues for files on SharePoint/OneDrive and Mac Excel 2016: The place where LOG_FILE = "" refers to depends on the OS and the Excel version, see Log File default locations. User Defined Functions (UDFs): Using ExcelPython’s wrapper syntax in VBA, you can expose Python functions as UDFs, see VBA: User Defined Functions (UDFs) for details.